Cutting-edge charging solutions ELEVAT combine top-class product and a resilient business model that moves borders. . The charging stations of its development are based on especially users' experience and derive from users' needs. Divergent and sustainable business model. The charging station as a marketing tool is a mean for attracting and detainment of the guests and purchasers. With already integrated flexible payment system can buyer charge costs of energy, time, random combination of these values or credits at local providers. 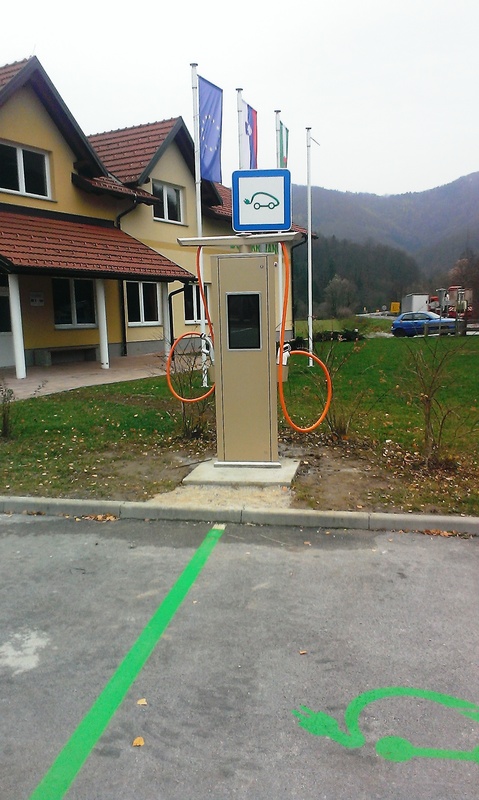 The new concept of DC charging stations; they do not demand powerful (and expensive) connectors to the electric network. With this, they become available to a broad circle of investors at different locations that are not covered with enough powerful connections. The fact is that charging stations are unjustifiably occupied by the users of electric vehicles; thus they leave cars a couple of hours parked after the completion of the charging. An innovative solution and a parking sensor at the station will handle this. ELEVAT – unique battery charging. The charging station has become top service, the concept of reliability, new experience, freedom of movement, sense, style, worldview, and not just an electrical device. You only need an electric vehicle and a mobile phone for the trip. LEVAT offers solutions which enable an electric vehicle user a precision path planning. Pre-conditioning is the system which offers working and vacant charging stations and their reservations. System notifies user about any possible malfunctions or any other obstructions, which could disable charging; at the same time it offers a quality alternative solution. Thus the user can rely on his very own electric vehicle. The base for charging service usage is a telephone call or a mobile app which is the only demand for its use. Application enables mobile check of the charging status, remote start or activation and abortion, time charging settings or limiting the costs and the amount of energy. All remotely monitored charging stations have the ability to regulate the charging speed in regard to current energy production. With this the charging infrastructure helps to stabilize an electric energy network and reduces the costs of electric energy. User-friendly system allows 100 % ad hoc usage of the system by unregistered users and an innovative paying model. Only the complete solution (technical equipment, application and a business model) will allow faster traffic electrification. The wall AC charger is suitable for all electric vehicles, from the smallest to the big cars. Wall mounted with a two-part structure, which means it is technical part inside the building, outside on the wall sockets and big screen. The screen contains space for instructions, notices, invitations, recommendations, advertisements, and prize games. Large and visible AC filling station in a sophisticated enclosure with big-screen display. 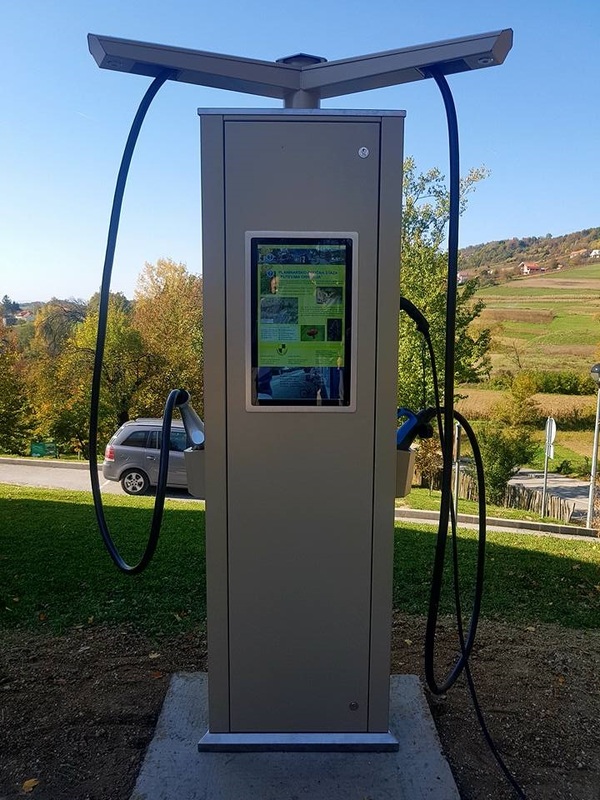 In addition to the prescribed Type 2 socket, the filling station also has Schuko sockets, as it is important to be placed a chance to fill all vehicles and not just cars. Depending on the available power, the customer can also choose a model with two Type 2 sockets and two Schuko sockets. 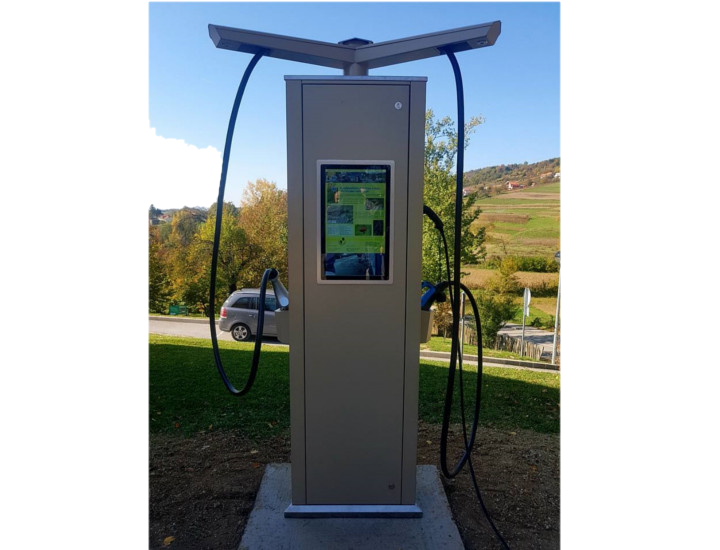 The electric charger allows optimum fast charging of all vehicles, as it is equipped with various standard connections: CHAdeMO, CCS Combo, Type 2 and of course Schuko charging sockets for charging other smaller electric vehicles. It allows simultaneous filling of three vehicles. A high-quality case is equipped with a large antivandal display on which different content of local service providers. DC Power from 15 kW (40A) to 60 kW (160A). Electric vehicle users mostly fill the car home at a house socket. Original cable allows charging with about 10A only at one stage (2 kW), which is It's relatively slow. Drivers who drive more kilometers pro day need it Faster charging. The ELEVAT 01 microwave charger allows you to adjust the charging speed and optimum speed according to domestic fuses. In a conventional house it can be recharged at least 3 times faster than with a serial cable. 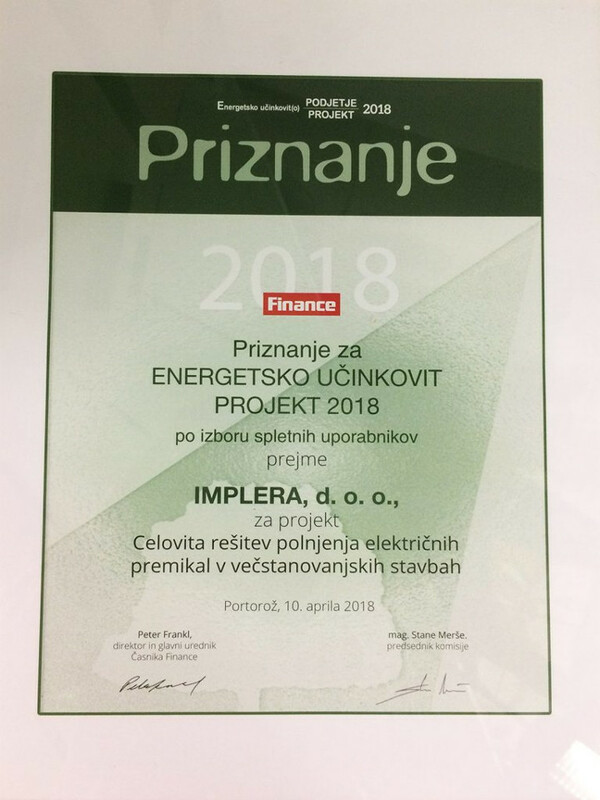 Bralci Financ so izbrali projekt našega podjetja, kjer smo pripravili celostno rešitev za prebivalce večstanovanjskih stavb za polnjenje električnih vozil. 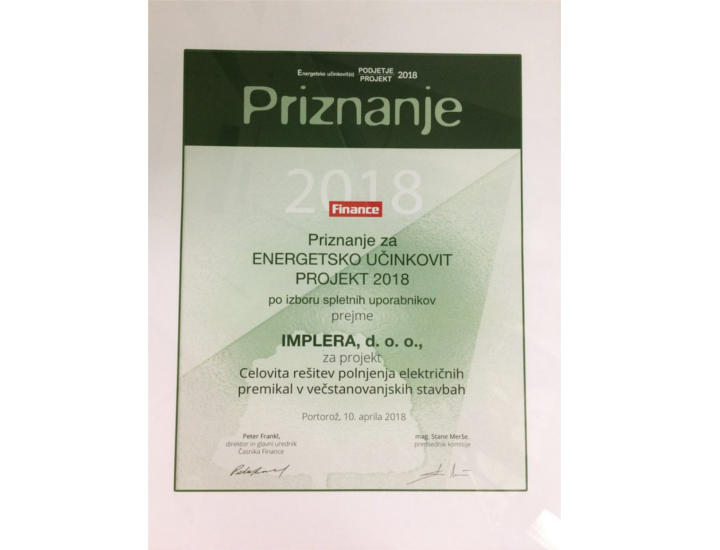 Projekt vključuje tehnično rešitev, pridobitev novega priključka električne energije, ureditev odnosov z etažnimi lastniki ter obračun in delitev stroškov med uporabniki. 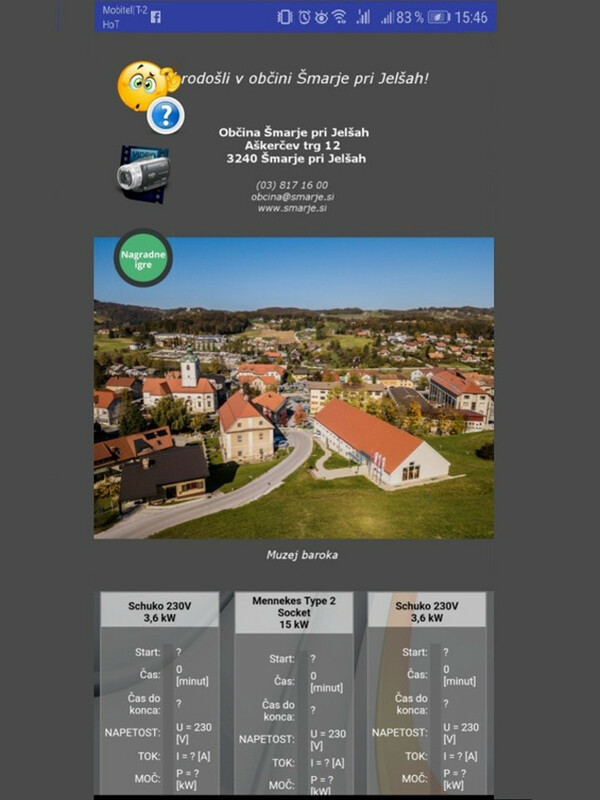 Svečana podelitev nagrad je potekala v GH Bernardin, Portorož, v sklopu programa 20. 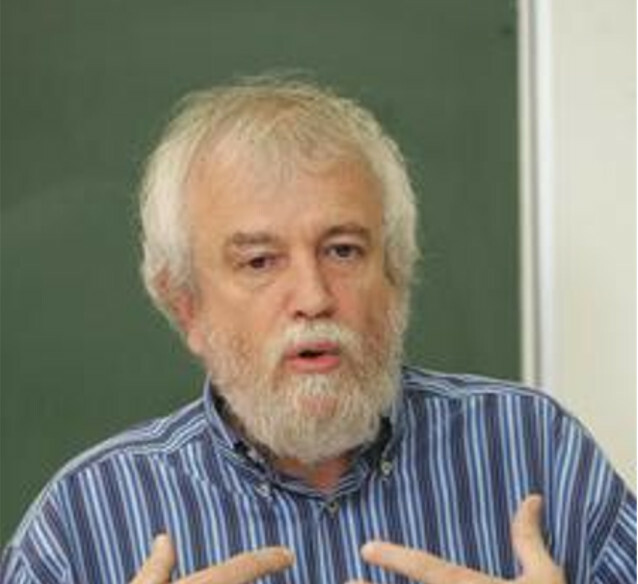 Dnevi energetikov. Starting charging with RFID or NFC card is not practical, and is not compatible with the EU Directice. Services must also be enabled for non-registered ad hoc users. The ELEVAT system allows you to start charging with a telephony call or mobile application. With the use of the Mastercharge application, the use of electric vehicles is simple and reliable. 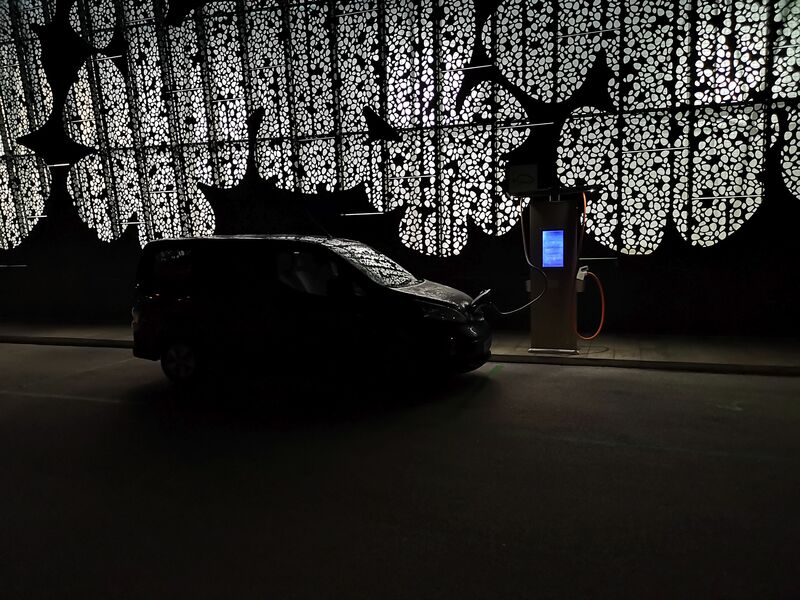 The user finds a freely operating socket, the reservation ensures that the charging station is free, navigation leads to the charger, and information on the application allows you to track the charging parameters during the work. Users of chargers for electric vehicles usually stay on the filling stations for some time. Charging screens, mobile application space, and other marketing sites tell them that they spend the charging time with service providers nearby, get to know something new, and take advantage of the time as useful as possible. SCompliant with the increase of demand for our products and services grows also our collection of products and services which we perform. In our offer can be found the solution for every buyer, from sole trader to small, medium-sized, large corporations and a public sector. 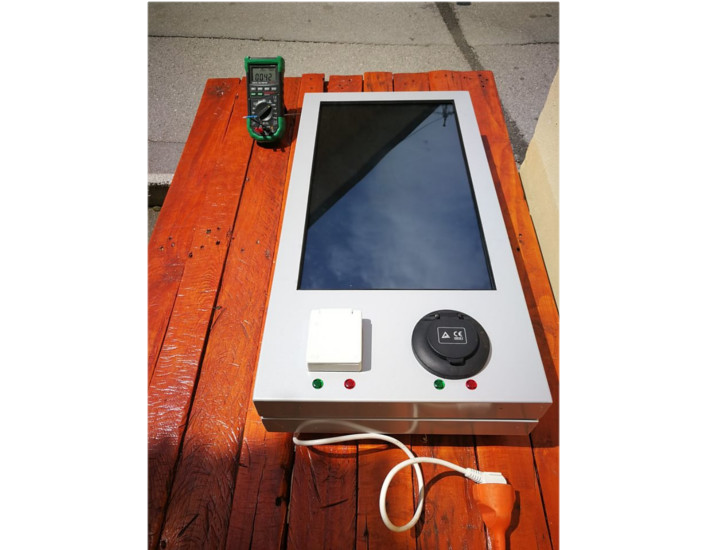 Available are AC and DC charging stations with intelligent ELEVAT system, which allows a line of handy functions; such as micro-charging stations which solve problems of sole traders, whether they have problems at home in their houses, multi-dwelling buildings or garages; connectible applicative solutions for trading malls; leading system stats as well as modern payment system. Business model diverts completely from other providers of charging stations in the market. We have also changed the functionality of charging stations, the tool for vehicle charging and charging of other appliances becomes also a futuristic marketing tool. The users of charging infrastructure plug-in their vehicle and hang around a certain amount of time, usually from a couple of minutes to even a couple of hours. This presents an ideal time to offer information and directions at a certain location where would be the best option to take advantage of time. The nearby coffee shop, library, pizzeria, fitness studio, city gallery or tourist attraction of surroundings are only the possibilities of the time usage. 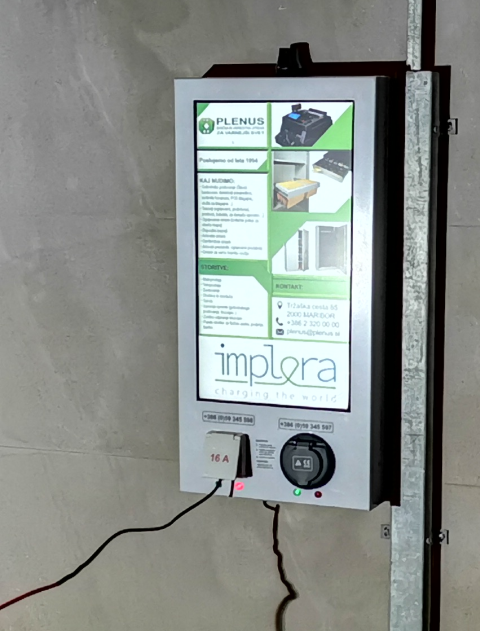 Charging infrastructure built by Implera allows a spot for the message intended for the users or just by-passers; whether it’s an add, questionnaire, prize winning game or something even more innovative. The sky is the limit. Flexible, safe and efficient payment system enables calculations in a way that the most benefits have (just) users. 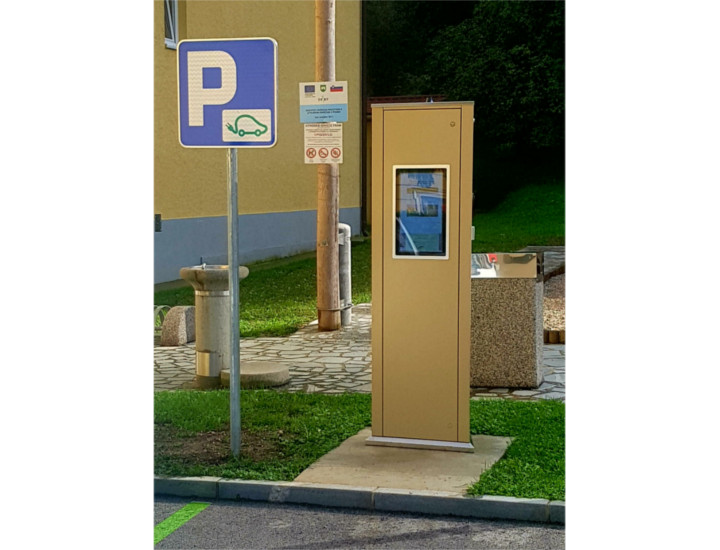 There are many options of payment: It can be either per energy, per time of charging, per time of leaving the parking spot after the charging completion, per duration of slow charging or a combination of everything. Different tariffs can be used, packages as well as other ideas. The payment can be a credit in a pub which takes care for the charging payment. Credit can be complemented via bank, credit cards, Paypal system, at automats or by providers. In progress there is also the possibility of payment with crypto coins. All users can charge their vehicles; also on payment charging stations. After the charging completion the user receives an sms message which includes PDF receipt. The payment due is 14 days or till the next charging. The user with negative credit balance cannot charge his vehicle until he has not settled the past debts. 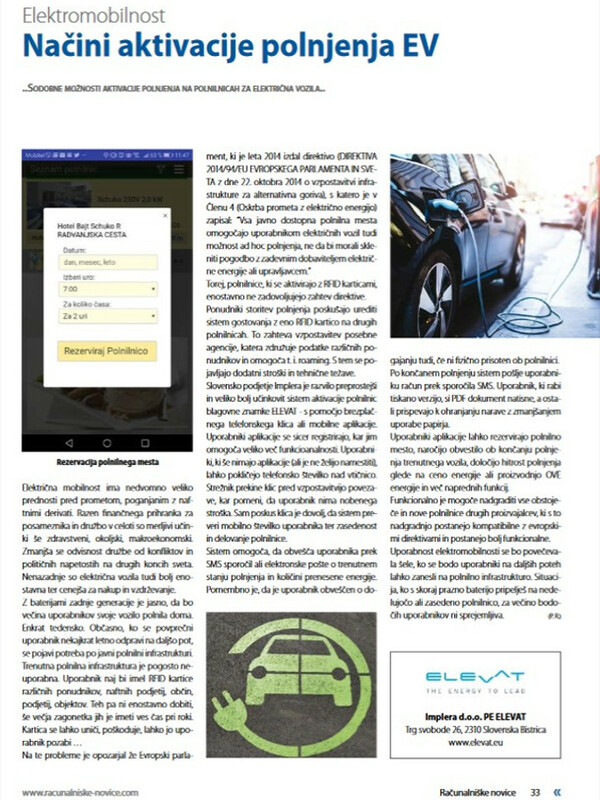 ELEVAT system is a fruit of 7 years of work and connecting of various experts in the field of e-mobility, telecommunications and ICT. It came to existence as an answer to up-to-date drivers' experiences by using electric charging stations. ELEVAT system varies from competition especially in communication between the mobile phone and the charging station directly or via the app. This enables activation and shutting down of charging, reservation of charging spot, modern payment system, following the actual data during the charging process and monitoring the statistical data already accomplished. 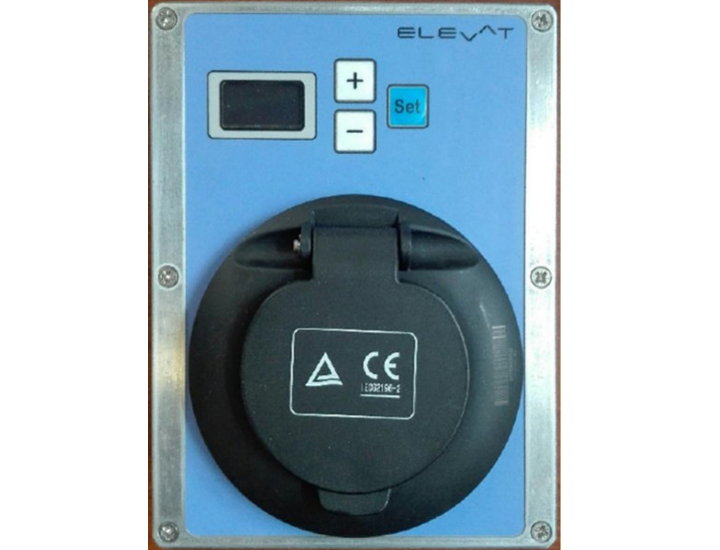 ELEVAT system is preparing many functions which will be in use in the near future, which embryos of development balancing electro modulling are already seen. System follows experiences of users and is trying to answer to the challenges of electric mobilities. ELEVAT offers charging stations users 24-hour support in agreement with the purchaser/owner of the charging station. Support and maintenance can be financed from the selling of commercial space on the stations' screens. ELEVAT charging stations communicate via servers and back office after specially designed robust protocol which works via D channel of speech telephony. Internet is less reliable protocol. And the consequence of its usage was the processing of local activations on the charging stations. With the use of ePD 2.0 protocol is possible to reliably authenticate user on server and to withdraw sensitive data and functions from the stations itself. ePD 2.0 protocol enables the use of much bigger amount of data than older versions; like for instance, OCCP with the goal of a bigger use of charging infrastructure. New functions are necessary today; tomorrow, with rising numbers of electric vehicles, they will be indispensable. DEPENDABLE TRAVELLING WITH THE MASTERCHARGE APP. 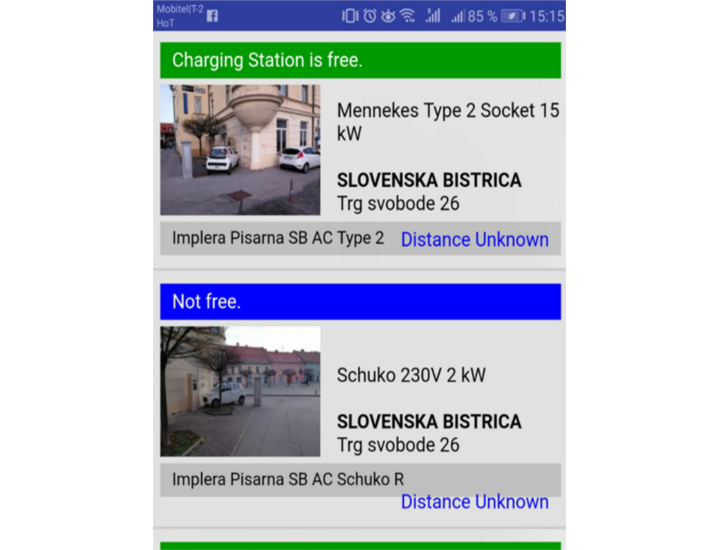 Innovative advantage of ELEVAT charging units over other charging stations in the market is web and mobile app MASTERCHARGE. It can be downloaded from the Google Play store for free. When user registers in an application he can manage all functions of the ELEVAT system (finding the closest charging spot, enabling reservation, payment and communication with the user, etc.). It is welcome that users complement the app with the addition of new charging spots which suddenly become available to others. User leads statistical data and info regarding the vehicle energy consumption. Data from app will not be used for other purposes and it will never be forwarded to other parties (unless vital on the law basis). Payment system takes place on bank sites or the payment system providers; which means that the app administrator does not have the payment instruments of his users. 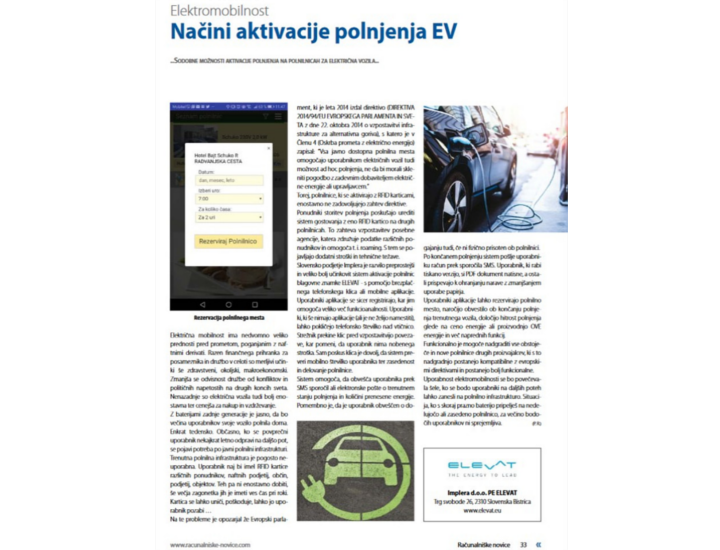 With app charging of electric vehicles becomes reliable; travelling with electric vehicle becomes less stressful, since it enables user: - finding the nearest working station, - making a charging time reservation, - navigation to location, - easy charging activation, - in case of occupied station the time reservation after the predecessor's charging completion (the user is notified by sms about his departure), - setting charging limit (amount of energy, amount of money, time), - acceleration or deceleration of charging speed in regard to solar energy manufacturing in environment, - service payment via flexible payment system (pay cards, PayPal system, Monetes, credits on user account), - regular charging monitoring among other activities (appointment, shopping, visiting theaters, etc.). Important European directives regarding the charging infrastructure. DIRECTIVE 2014/94/EU EUROPEAN GOVERNMENT. Determines important directives with a goal of encouraging the fastest possible transition from petrol to alternative ways of mobility. The document will most probably improve; since there are some provisions pretty much illogic (most cars on AC charging stations power 22kW charge much slower than DC charging stations power 10kW, yet AC charging stations are labelled fast), but the basic idea is positive. Article 9.: ''All publicly available charging stations enable electric car users also the ad hoc charging possibility without them having entered into a contract with the concerning electric provider or operator''; they are directly prohibited to activate with RFID cards because ad-hoc users simply cannot own have them. Especially in the night time or during the weekends. Strategy RS about the charging infrastructure. 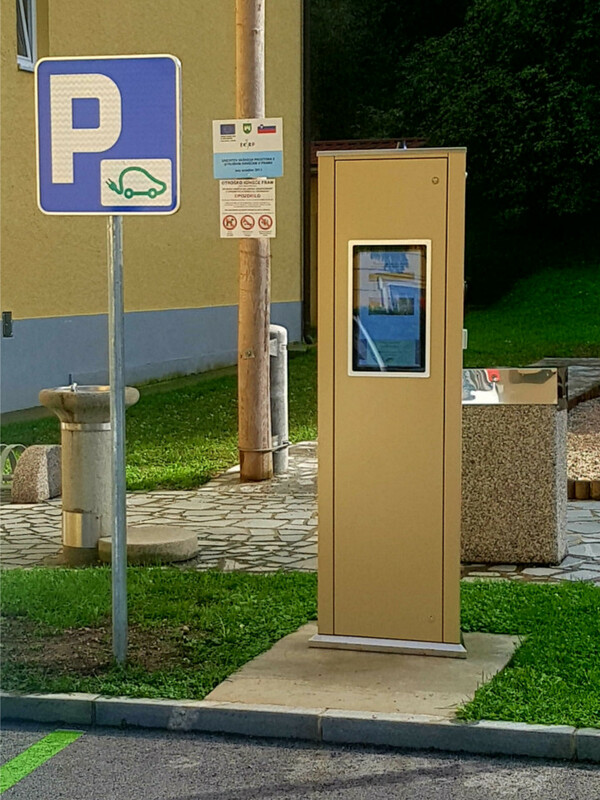 In Slovenia after the year 2030 there will not be allowed first registration of cars that carbon print will exceed 50g of carbon dioxide per kilometer. In comparison, nowadays are below this limit only electric cars and connective hybrids. 5 years prior to that will be restricted first registration of personal vehicles and light cargo vehicles that have according to manufacturer's declaration total carbon print less than 100g of CO2 per kilometre. These are important goals of the Strategy regarding alternating fuels, which was accepted by the Slovenian government. This strategy fosters the growth of electrically powered cars, hybrids and fossil vehicles which have significantly lower impact on surroundings than the vehicles we use today. Fast charging is not always optimal. Connection to the network that enables fast charging is more expensive. Sometimes the effect does not weigh the starting and monthly costs. On the other hand, it is not convenient if the station notifies you during your lunch break that it's fully charged and that you have to move your vehicle. The station owners must know the reasons why they have set the charging stations and how much time should the users linger there. Hotels, restaurants, movie theatres, shopping malls, schools, corporations, ski resorts or gas stations have divergent visitors who have various needs. The special challenge is the residents of the multi-dwelling buildings and electric car owners who can with the proper equipment speed up the charging. The station purchaser with the correct decision obtains happy users and greatest benefit. Making a reservation of the charging station. VMost electric vehicles are charged at home or at the job. On the paths longer than the car's autonomy we need a charging station that will charge up the vehicle in the time of rest. It is quite embarrassing to find the planned station occupied. These inconveniences are solved by making a reservation of the charging station with the app MASTERCHARGE. For ensuring working it is vital a different charging activation such as a mobile app or a telephone call free of charge above the socket number. A simple and accessible solution which solves daily problems, and approaches electro mobility to a wider population. Charging station, please send me an SMS when the current vehicle finishes charging. In case you forgot to make a reservation of a charging spot, and the desired socket is occupied the problem solves the third icon on the app MASTERCHARGE. The current user will receive an SMS that there is somebody waiting. After the charging completion, you receive an SMS that the station is vacant and you have next 15 minutes to make a reservation. Easy, isn't it? Charging stations with the battery storage of energy..
ELEVAT in collaboration with the company Sitel provides battery storages for all types of stations. Battery storages are used in case of a bad infrastructure on the location of a station. Energy from the network slowly charges batteries, yet the vehicle is charged very fast. Batteries can be charged with solar energy or through the night when the costs are lower. We use different batteries: From gel lead to high-tech and lasting LTOs. Possible are also the solutions of the remote stations that use batteries as a container for energy reservation. 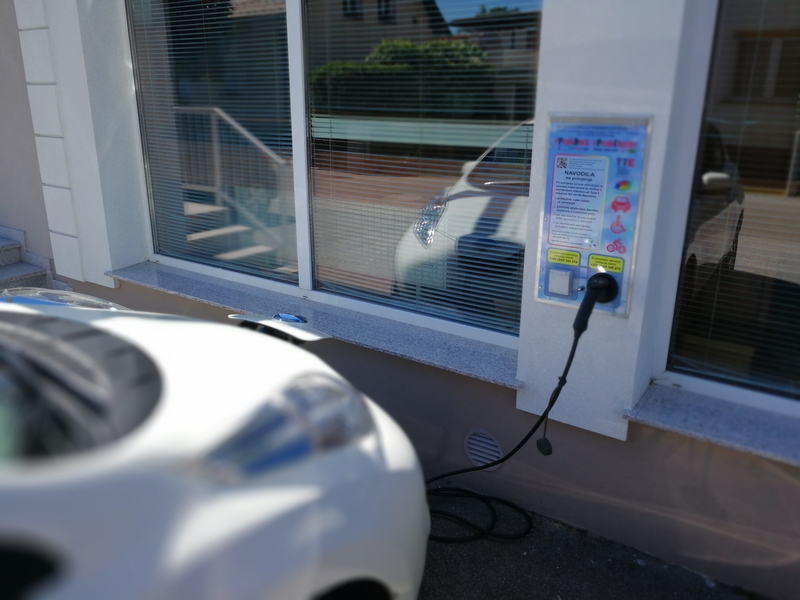 Only standard for charging all-electric vehicles is 230V "schuko" socket. You obtain the cable for charging your vehicle at the purchase from the manufacturer. Advanced systems enable charging with various powers dependable from the available network energy or the battery condition. ELEVAT can give you tips by purchasing cables and allow you to charge every vehicle on every socket optimally fast. ADDITIONAL OFFER FOR YOUR CUSTOMERS.. Vehicle charging lasts from a couple of minutes to several hours. The time during the charging is therefore ideal for a coffee with a friend, a meeting with a business partner, lunch with family, shopping or getting a haircut, visiting fitness studio or a theatre; tourists can spend their time sightseeing. For these and many other reasons, of course, users of electric motors prefer to use charging solutions that are close to their planned activities. We are sure that you want to be ahead of the competition and provide an additional offer to your customers. Investors' interests lie in: 1. selling electric energy for profit 2. increasing visibility and a positive image in the social environment 3. increasing the visit of their outlets and thus increasing the turnover of their primary activities. The ELEVAT charging stations are designed to at the same time satisfy the interests of investors and provide users with the unique user experience. Hotels, catering and other service outlets. 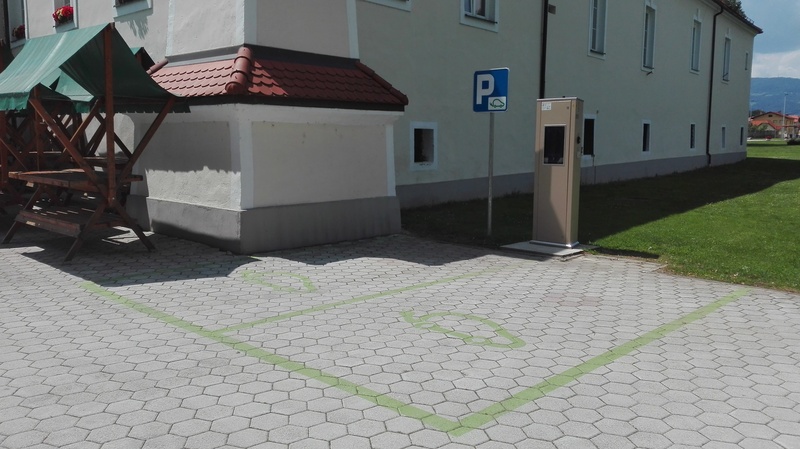 Prior to setting the charging station, it is necessary besides the users' needs to estimate the location of instalment and the activities that it provides. It is very inconvenient that the car is fully charged before you finish your meal or any other activity since you are occupying the charging spot. That's why it is recommendable where guests linger for longer periods of time to install slow charging units. 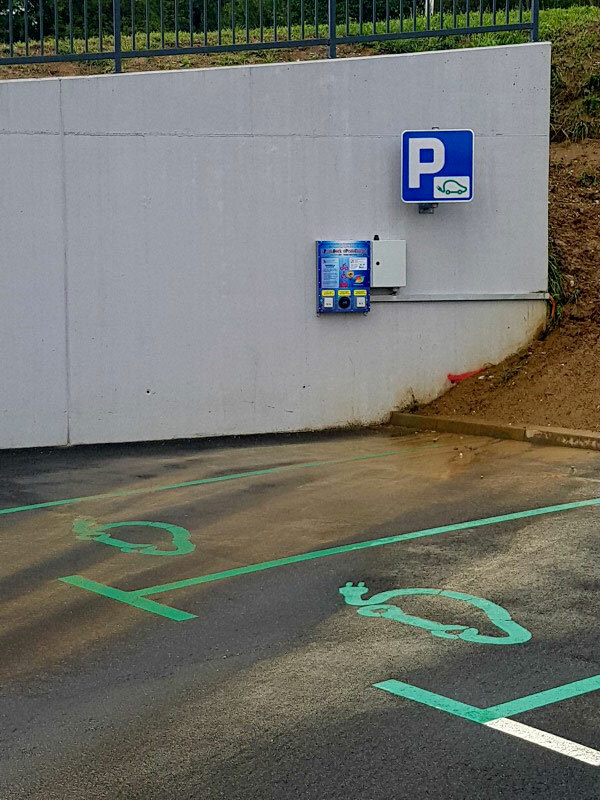 The most important task in planning installing the new station for electric vehicles is planning the charging characteristics and dimensioning the connection to the electric network. The power of the connector and the achieved tips of energy present the vital part of maintenance costs and station usage. Energy is charged, and it is usually connected with the charging time, the time of the user's presence. Correct station characteristics planning assumes optimum achievement of station's instalment. ELEVAT stations are additionally equipped with 24-inch touch screens where users can get information about the goods to offer in the centre. 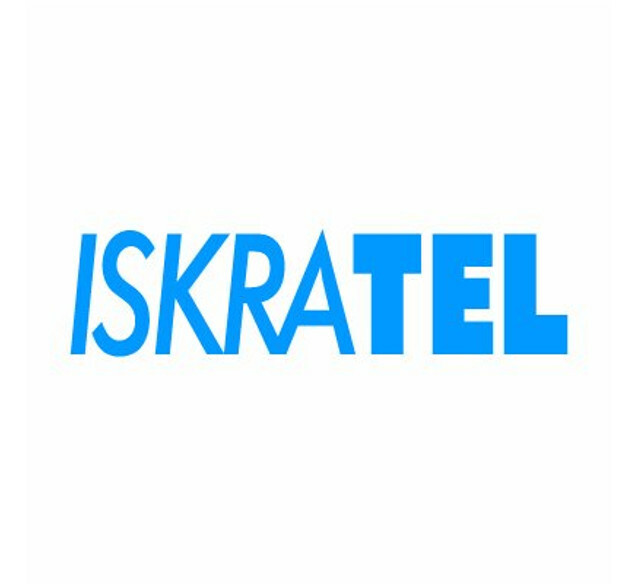 It is recommendable to connect cards or apps of the investor to ELEVAT system as this allows an overview of the connection between the number of charges, the consumption of energy, and the consumption of money by users. Tourist facilities, camps, sports and cultural centres. Charging of electric vehicles takes place differently as the fuelling of internal combustion vehicles. People do not arrive at the charging station merely with a purpose of charging the vehicle. Users drive to their popular destinations to do their activities and use time as they please. Indisputable fact in future; users will spend their time where they will have the ability to charge their vehicles meanwhile. Hospitals, health centres and homes for the elderly. In front of the mentioned organizations, since from the activities itself, there should be charging stations appropriate for all types of vehicles, of course. Visitors and employees are one segment that needs at these destinations the possibility of charging. Important are patients and the tenants of the homes for the elderly. An increasing number of older people opt for mobility assistance and use smaller electric vehicles, quadricycles and scooters. Physically disabled persons also need their wheelchairs charged. With simple charging solutions for this kind of vehicles, we allow people greater autonomy and a wider life cycle. Charging station in the parking lot or garage presents socially accountable organization. Not only is such an organization friendly to its employees, which enable them to refill during working hours, but it also has an eye to customers and business partners who travel with electric vehicles. The proportion of electric vehicle drivers among residents in multi-dwelling buildings is also increasing, where the problem is usually a free parking lot, let alone a filling station. With simple micro-charging station, intelligent server reception, and a little technical component it is possible to optimize charging on more demanding locations. We are a team of enthusiasts united with the common interest in the field of e-mobility. Our voluntary activities grew into a business opportunity. Our biggest strength derives from interconnectedness and compatibility. Each of us is active in several fields which presents our highest added value. 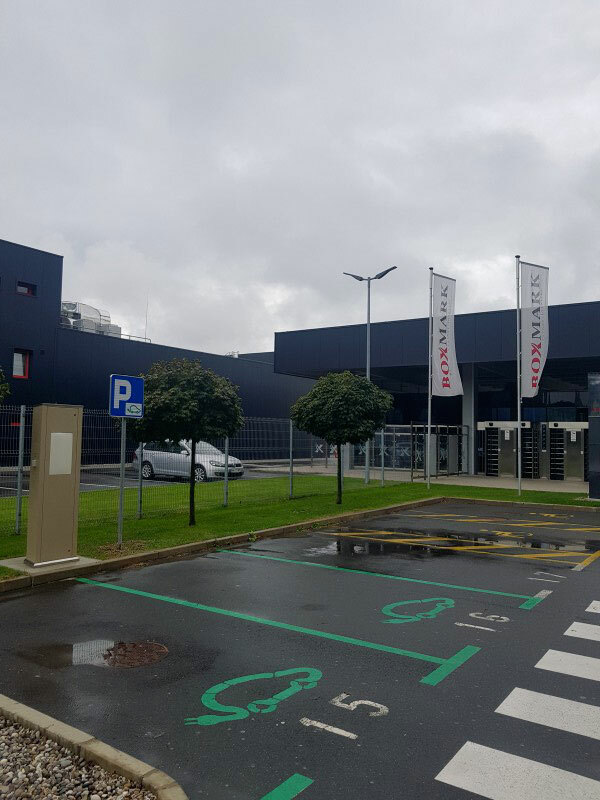 VAlways and everywhere, the most important is the user experience and the satisfied owner - both factors are our priorities in finding the optimum solutions, planning and manufacturing of new products as well as ELEVAT system upgrade. 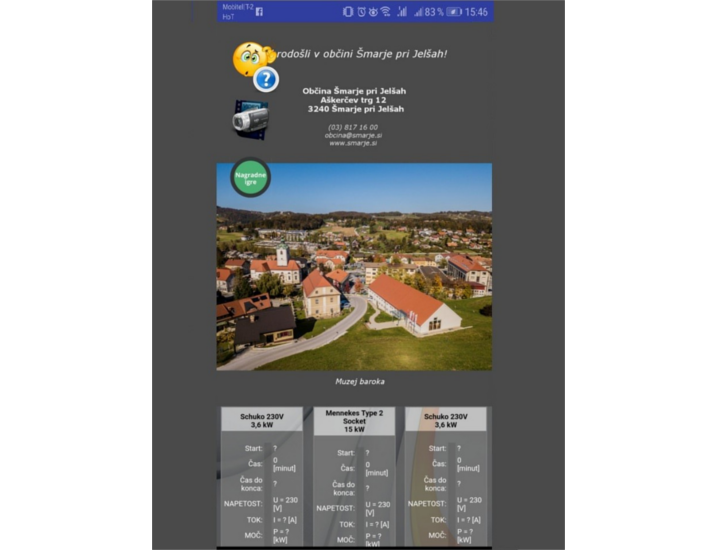 Communication with already existent and potential users and owners takes place indirectly via telephone support +386 (0)59 02 55 61 and email address info@elevat.eu, where are we available for all questions as well as new suggestions and commentaries. Good and efficient mutual communication is the foundation for everything. Our goal is to set a divergent and a user-friendly charging infrastructure for e-movables so that anyone could drive without worrying with even a small mileage; since he will find everywhere an appropriate connector for charging and he would be able to reserve it in advance. This is one of the most important conditions for the development of e-mobility. Bad air quality is becoming one of the key environmental challenges since it diminishes the quality of life in urban areas and shortens people's lives for a couple of months. The community awareness about the air quality and the harmful influences of traffic-related particles on people's health is too feeble. Local communities despite the applicable measures too slowly introduce handy actions. 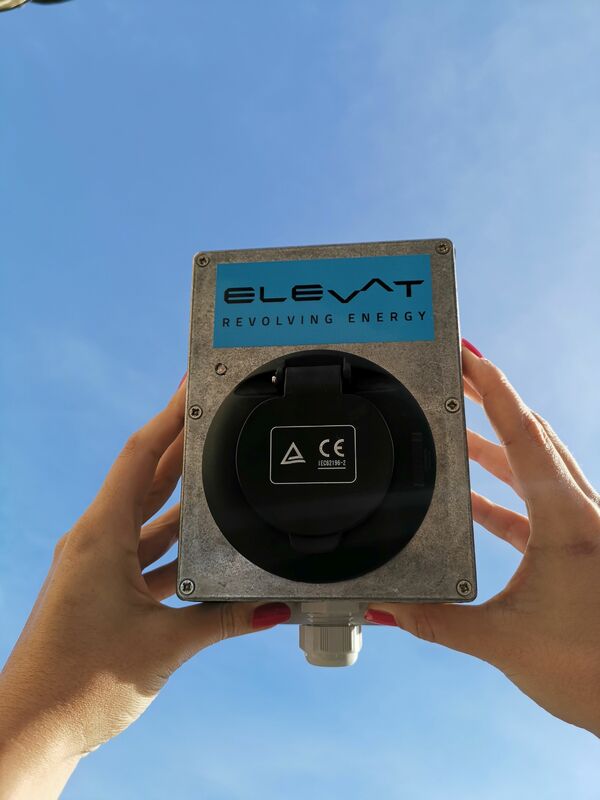 That's why ELEVAT directly with its products and indirectly at certain public events, roundtables, notifies public about the actual facts, and already introduced practices in the field of e-mobility. Zorica is accountable for the legal work of the company and professionalism. The field of her work embraces organization of a working process, regulating issues in the field of law of labour, leading projects, preparation of tender documentation and search for new business opportunities. With the ample desire for improving the world, she perceives her duties as a life's mission. 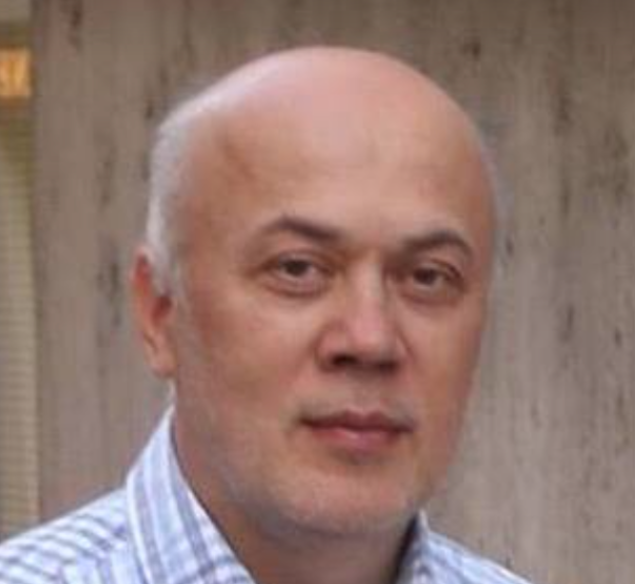 Teo is the main idea leading manager of the company. He efficiently organizes technical fields, and he is goal-oriented. Besides leading and planning he also supervises the realization of the projects and contracts. His fabulousness lies in initiating cutting-edge methods to all spheres of a working environment. 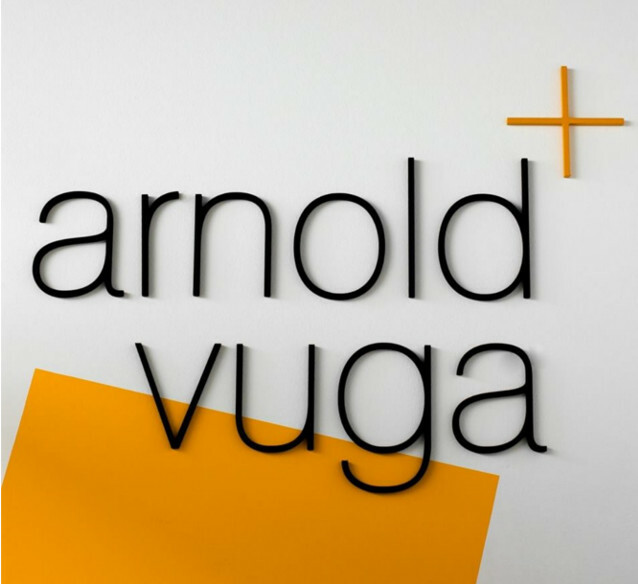 Part of his responsibilities includes tracking new suppliers, service performers, and new purchasing routes. Electro-mobility is his life. 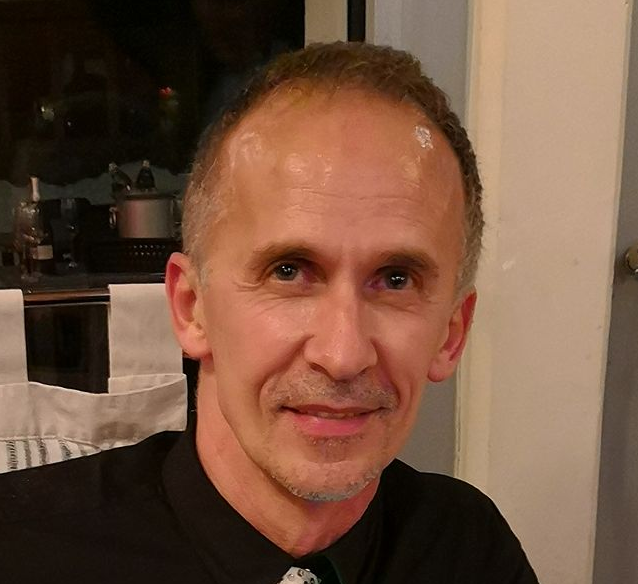 Jože is a chief HARDWARE developer, who possesses a wide range of various kind of knowledge(references), acquired with a longtime science research work in the field of automatization, electronics, communication, informatics, etc. ; he offers high tech solutions for the charging of electric vehicles. Matej is the head software developer. He always in the shortest time possible realizes even the craziest ideas and solutions that enable faster implementation of electro-mobility into regular usage. 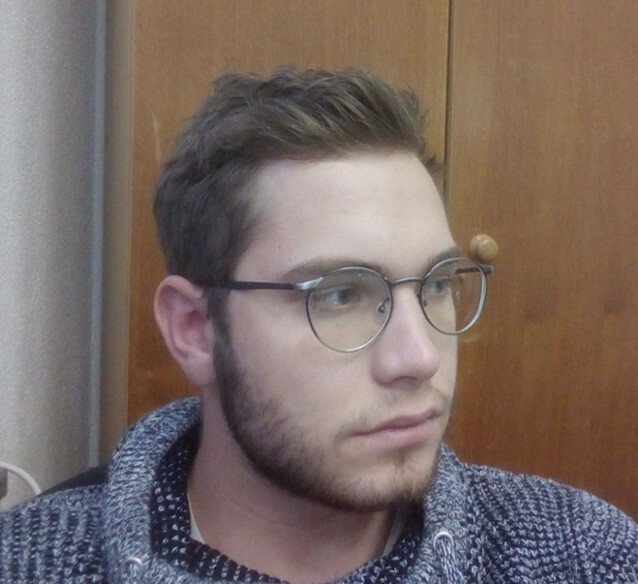 He is responsible for the app development, the development of the payment system, the development of the specific functionalities on the charging stations, preparation of the platform for adding the content and prize-winning games on the screens as well as the realization of a daily small-scale idea. 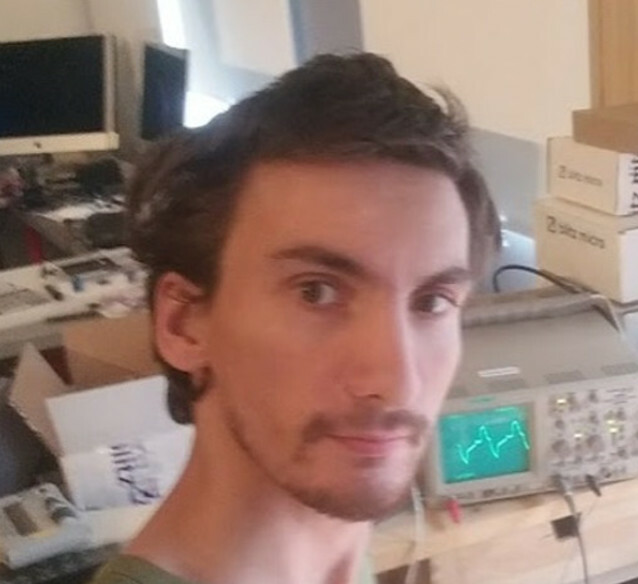 He has unified his love for programming with the field of electro-mobility, which is very close to him, this perplexity reflects in his work. 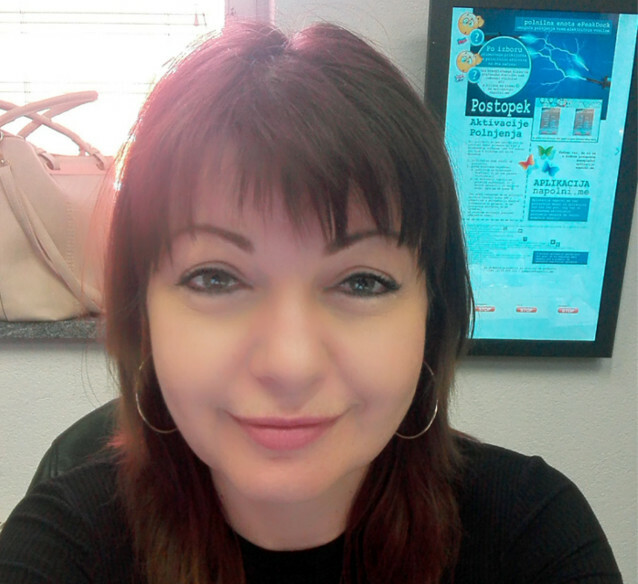 Tamara performs works in connection with all business documentation, manages personnel matters, takes care of the up-to-date business, leads material accounting, cooperates in preparing the monthly inventory and prepares invest plans and reports. She professionally communicates with clients and business partners. In the company, she is the unifying piece between all working areas, and because of her positivity she is the indispensable motivator of the entire team. 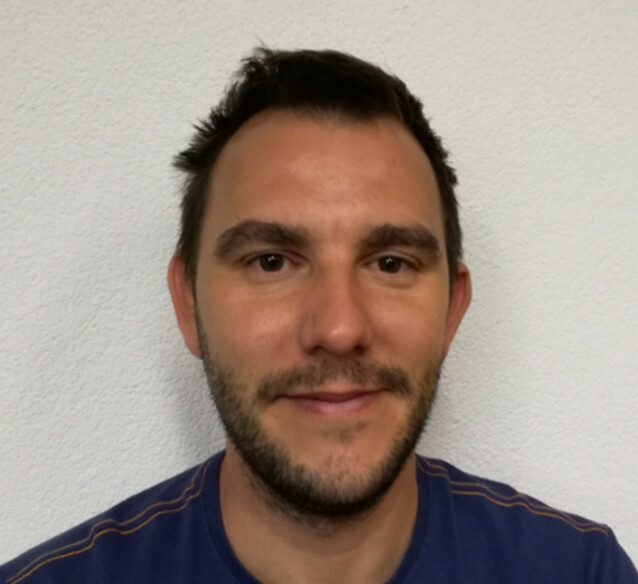 Klemen is mechatronic, an expert for the app development and work on a 3D printer. He cooperates by developing technical solutions; that's why he is indispensable when comes to instalment, servicing, and in the field with customers. With his youthful energy, he drives work processes and solves the most insoluble puzzles. 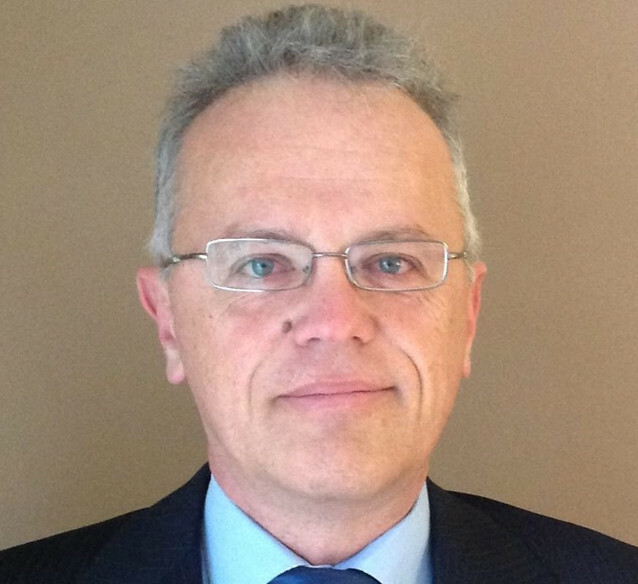 Branko is the leading sales manager. Besides the strategic sales organization are his main tasks leading and development of cooperation with buyers, preparation of sales plans, sales goals and setting selling priorities, monitoring sales realization, preparation of analysis and reports, and management of sales logistics in general. Because of his exceptional organizational skills he leads the sales team, is their support and a motivator. Anton maintains and installs products and develops electronic components. As the head of assembly and maintenance, he ensures the smooth running of the assembly from the preparation in the workshop to the realization in the field. He possesses a treasure of practical knowledge in the field of electronics since he is a 'panacea' to every problem. Users of mobile devices on the Android system may use a mobile app MASTERCHARGE. With the mobile app, you will always know where to charge your vehicle, and you will not drive to malfunctioned or engaged stations. Other functions are available to registered users. Verjamem, da je lahko svet boljši, če nam ni vseeno. Ignoranca in nedejavnost ne prideta v upoštev, zato ELEVAT ne odneha niti, ko je težko. 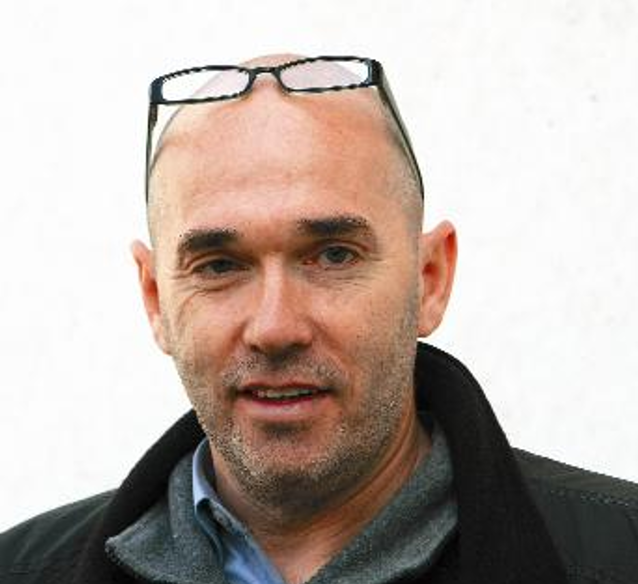 Teo Bunta CEO, Implera d.o.o. PE ELEVAT. Vse je energija, torej gibanje. Dobra energija med nami pa lahko premika vesolje. 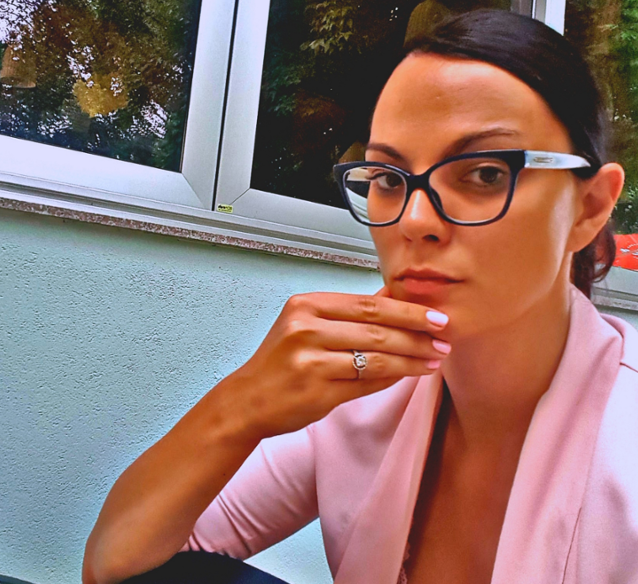 Zorica Sekulić Co-founder, CEO, Implera d.o.o. PE ELEVAT. Write a question, opinion or praise.